The majority of this year’s most exciting mobile gadgets are powered by quad-core processors, from the Samsung Galaxy S3 to the Google Nexus 7, however none hide a Qualcomm chip inside, as the famous manufacturer has so far held off entering the market. We knew a Qualcomm quad-core chip was coming, but the company had faith in its range of dual-core S4 processors, which power the 4G LTE variants of international 3G quad-core phones such as the S3 and the HTC One X, and wasn’t rushing into anything. This week Qualcomm has formally made the new Snapdragon S4 Pro, its first quad-core chip for mobile, available to manufacturers. The very first device to utilize the S4 Pro is a reference design tablet, and it has been put through its paces in a variety of benchmark tests, revealing how it stacks up against the competition. Its Quadrant scores are nothing short of astonishing. Using the popular, all-round performance benchmarking test, it trounced the Nvidia Tegra 3 in the HTC One X, and Samsung’s Exynos 4 Quad in the Galaxy S3, returning a result of 7,635 against 4.430 and 5,283 respectively. Switching to GLBenchmark for an assessment of the S4 Pro’s computational and graphical abilities, TheVerge.com noted that 720p video ran to 131 frames-per-second, eclipsing even the Exynos 4 Quad’s impressive 101 frames-per-second, and easily besting the One X’s 65. Of course, benchmarks are just one side of the story, and in the real world, what sounded like a huge performance gap is sometimes barely noticeable, usually due to software restrictions. The APQ8064 Snapdragon S4 Pro has four Krait cores, each running at 1.5Ghz inside the developer tablet, and it uses the new Adreno 320 graphics chip too, which is said to be twice as fast as the Adreno 225 and will bring improved dynamic lighting and shading effects to games. With quad-core powered devices, battery life is always a concern, and rather than go down the same route as Nvidia with its fifth “companion” core on the Tegra 3, Qualcomm is singing the virtues of the S4 Pro’s asynchronous timing. This allows each core to run at different speeds, or to be isolated entirely, to conserve energy. 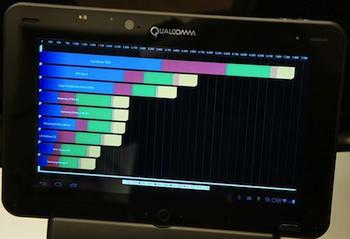 Qualcomm also uses the same technology in its dual-core Krait S4s too. If you’re desperate to get your hands on a device that uses the new Krait S4 Pro chips, then you can buy the Mobile Development Platform Tablet directly from manufacturers BSquare. It has a 10.1-inch, 1368 x 768 pixel touchscreen, a 13-megapixel camera, 32GB of internal memory, 2GB of RAM and a host of physical connections. It does cost $1300 though, and is really only suitable for developer use. Qualcomm say consumer products using the Snapdragon S4 Pro will start appearing towards the end of this year, so perhaps we should look out for the first of these next generation Snapdragon-powered devices during the IFA 2012 trade show at the end of August.